Michelle Davies | The Journal Gazette: Wheel assemblies, wooden supports and a crew of more than a dozen workers today moved the Baltes-Cambray Building across Superior Street. Plans are to convert the building into a restaurant. The Baltes-Cambray Building moved today from the northeast corner of Harrison and Superior streets to the southeast corner. 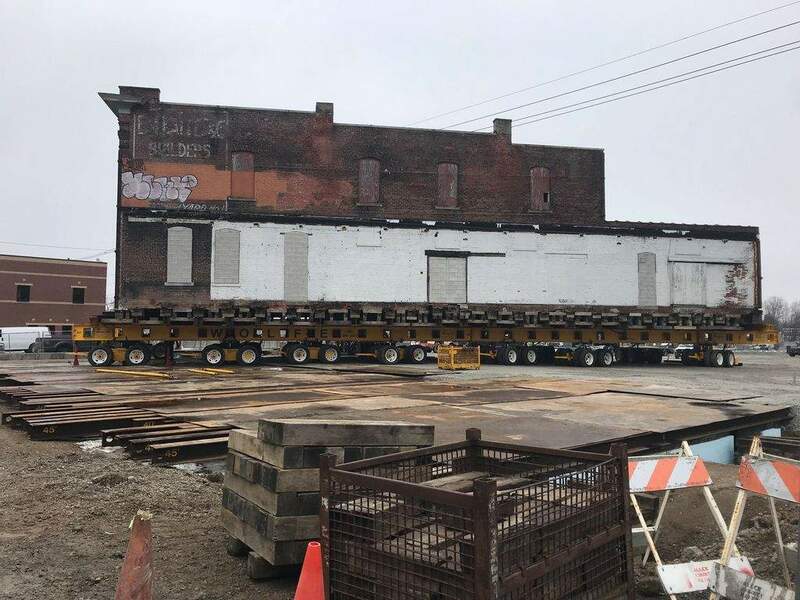 The feat took about a half-dozen bright yellow wheel assemblies called dollies, a Jenga-like structure of wooden supports and a crew of more than a dozen experienced workers to inch the structure across Superior Street. The move was the building's second in a little more than a year. The first was in January 2018, when the building was moved from the northwest side of Harrison Street to the northeast to aid construction of the pavilion in Promenade Park. Jeff Hall, who with his brother Bud Hall, long-time Fort Wayne restaurateurs, plan to convert the solid red-brick building into a two-story eatery, said Tuesday's move was a bit more complicated than the first. Not only did the building have to cross the road, it also had to be turned 90 degrees so the facade will face west, Jeff Hall said. "It was a very difficult proposition. I wouldn't recommend it," he said, as workers from Wolfe Home and Building Movers scurried in and out of the undercarriage of the building while it sat solidly across Superior Street. "Do not try this at home," he added with a grin.